1 The tenth anniversary of the LOPSTR symposium provided the incentive for this volume. 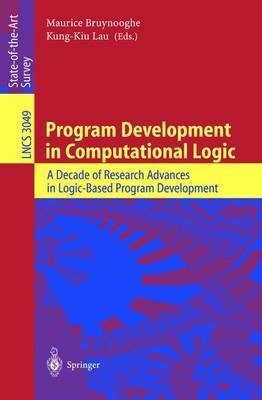 LOPSTR started in 1991 as a workshop on logic program synthesis and transformation, but later it broadened its scope to logic-based program development in general, that is, program development in computational logic, and hence the title of this volume. The motivating force behind LOPSTR has been the belief that declarative paradigms such as logic programming are better suited to program development tasks than traditional non-declarative ones such as the imperative paradigm. Speci?cation, synthesis, transformation or specialization, analysis, debugging and veri?cation can all be given logical foundations, thus providing a unifying framework for the whole development process. In the past 10 years or so, such a theoretical framework has indeed begun to emerge. Even tools have been implemented for analysis, veri?cation and speci- ization. However,itisfairtosaythatsofarthefocushaslargelybeenonprogrammi- in-the-small. So the future challenge is to apply or extend these techniques to programming-in-the-large, in order to tackle software engineering in the real world. Returning to this volume, our aim is to present a collection of papers that re?ect signi?cant research e?orts over the past 10 years. These papers cover the wholedevelopmentprocess:speci?cation,synthesis,analysis,transformationand specialization, as well as semantics and systems.